For best results use Microsoft Internet Explorer 4.0 or later. © CORVETTE,and all Corvette Emblems are registered trademarks of the Chevrolet Motor Division, General Motors. Corvette introduced. The first Corvette appears at the 1953 Motorama, and Chevrolet is besieged with requests for a production version. Many skeptics do not believe Chevrolet will offer such a radical design for mass production. 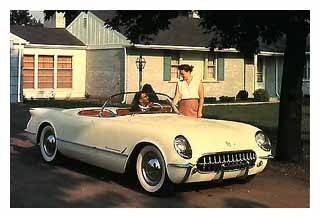 Corvette is the first series-production car with a fiberglass body. The 1981 Corvette was the first Corvette to be built simultaneously in two locations. The first Corvette rolled off the assembly line at the new Bowling Green, KY plant on June 1, 1981 and the last Corvette to be built at the St. Louis, MO plant rolled off the line August 1, 1981. The 1981 Corvette was also the last model to have a manual transmission available until late in the 1984 production year. Until its last car, the St. Louis plant continued to use lacquer paints, while the new Bowling Green plant used a new paint process which used enamel base coats followed by clear top coats. 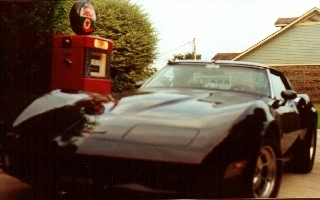 A few other firsts for the 81 Corvette was: Magnesium valve covers, Stainless Steel exhaust manifolds, computer controlled ignition timing and air-fuel mixture,electric cooling fan and a fiber glass/composite mono leaf transverse rear spring which weighs only 8 Lbs.Only one engine was offered for all 50 states and put out 190 hp.I love this car. It performs and handles great. Owning and driving a Corvette.Is the ultimate way to enter your golden years! In 1981 the Corvette sales brochure had the following statement: "No other American car looks like or stirs the spirit like a Corvette. It's been this way since the first Corvette rolled off of the assembly line in 1953!" This statement still holds true today! Endless Love by Diana Ross and Lionel Richie stay at #1 for 9 consecutive weeks. It was one of Motowns most successful single. This was the year princess Diana married Charles and the TV show Dallas made its debut. Ronald Reagan and the Pope survived would be assassins. Iran releases hostages after 444 days. This site is dedicated to America's only true Sports Car - the Corvette; to the National Corvette Museum located in Bowling Green, Kentucky; and to the dedicated Corvette enthusiasts who maintain and support the wonderful Corvette Mystique. For classic Corvette pictures,1981 Corvette Specifications and other links, just select from the ICONS below! If you own an 81 Corvette, then click on the Logo below, and register at the L81 Corvette Registry! You will meet a bunch of great people!